Zip-Lining is probably one of the most popular activities on the island. 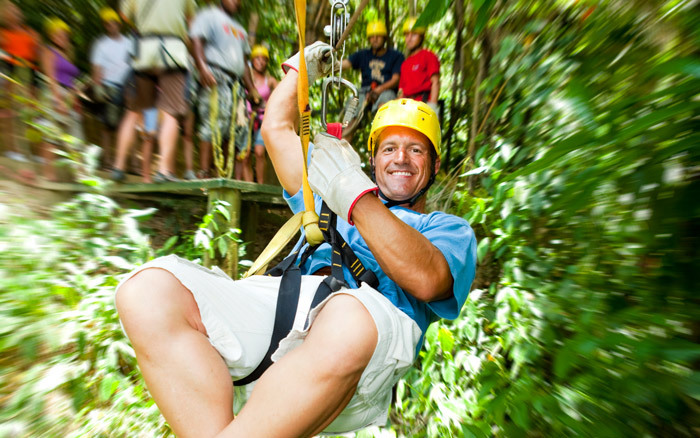 From witnessing local wildlife to enjoying the cool jungle canopy, a zip tour is an ideal activity for people of all ages and abilities. The tour is led by trained professionals and the equipment is modern and safe to use. Once you’ve experienced your zip-lining adventure, you can visit West Bay Beach and enjoy its white sand and turquoise waters. Did you know that Roatan is home to a variety of wildlife and offers an opportunity to get up close and personal with a number of different animal species? Our Roatan Wildlife & Beach Tour is especially popular with families and includes a visit to the popular Iguana Preserve and Sloth Reserve and ends with a visit to a private beach club. Going on the Roatan Bar Hop Tour is one of the best ways to spend your time on the island. You will have a chance to meet and socialize with fellow travelers and get to know the best beaches and bars on the island. If you wish to experience charming scenery and explore all the hot spots on the Western End of Roatan, this tour should definitely be included in your Roatan travel itinerary. The tour includes a soda, basic well drink, or a free national beer at each bar, a visit to the Roatan Rum Factory, and air-conditioned bus transport. Roatan is well-known for its excellent beaches, a variety of wildlife, spectacular scenery, and plenty of natural wonders. The island is also one of the most popular cruise ship destinations in the region, so it comes as no surprise that there is an abundance of great tours available on the island. One of these tours is the popular Best of Roatan Island Tour that offers visitors a chance to customize their own adventure and choose their favorite activities and attractions. Besides the basic package that includes a guided tour with your own selection of activities and attractions and air-conditioned bus transport, additional activities such as a glass bottom boat tour, boat snorkelling, a visit to the sloth preserve and others are available as a tour add-on.